Members of the choir perform the Philadephia Community Mass Saturday at Mother Bethel A.M.E. Church in Society Hill. Of all the ways revelers have noted the recent centenary of Leonard Bernstein's birth, it's safe to say none has caught the spirit of the composer quite the way the Philadelphia Community Mass has. The piece honors not just the composer, but the act of composition itself. Inspired by the Bernstein Mass, it barely references the work. The looseness of its nod to Bernstein is its strength. The Philadelphia Community Mass debuted last summer, and unlike many other new works that languish after their premiere, it continues to have a life. 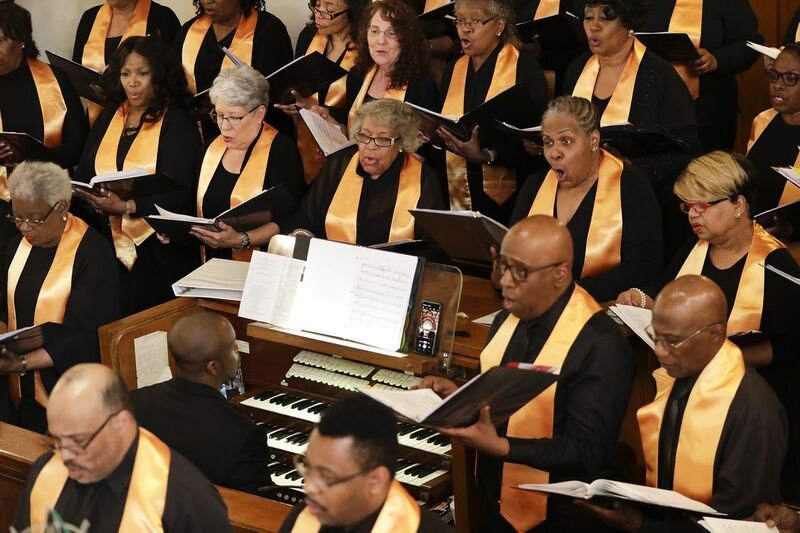 It’s been performed at the Kennedy Center (where Bernstein’s Mass was unveiled as part of that complex’s opening in 1971), and Saturday afternoon it received an encore performance in Philadelphia, at Mother Bethel African Methodist Episcopal Church in Society Hill. It’s hard to imagine anywhere in the city bathed in as warm a community glow as this place was in the presence of this music. The piece was commissioned by the Mann Center, the brainchild of its longtime artistic collaborator Nolan Williams Jr. of NEWorks Productions, who acted as a kind of musical midwife. It has the bones of a Mass, but with its various movements divided among four different composers: Ruth Naomi Floyd, Jay Fluellen, Evelyn Simpson Curenton and Rollo Dilworth. It will be performed again June 24, though in another form. Williams is orchestrating four of its movements to be played by the Philadelphia Youth Orchestra before the Philadelphia Orchestra’s performance of the Beethoven Symphony No. 9, which will mark the Mann debut of orchestra music director Yannick Nézet-Séguin (himself no small Bernstein fan). Anyone who thinks having four composers write one piece means courting a disjointed experience doesn't know Bernstein's Mass, a joyful and moving jumble. At Mother Bethel on Saturday for the "Philadelphia Community Mass." Williams on Saturday reminded the audience in this historic church that Bernstein’s Mass is about good people wondering how to hang on to faith in crazy times. He didn’t need to say it, but the significance of the Philadelphia Community Mass arriving now was lost on no one. Bernstein’s piece came amid social upheaval – it caught the eye of then-President Richard Nixon, whose chief of staff, H.R. Haldeman, declared it “weird” – and this new one acknowledges the outside world. Like the Bernstein Mass, there is a celebrant and skeptical voices with dueling ideas about faith, and the music delivers the message in a variety of styles, here infused by spirituals, gospel old and new, classical, and jazz. Sections of spoken word alternated with movements sung, with chorus, two speakers (Leslie Callahan and Clayton Prince), and three vocal soloists (sopranos Paula Halloway and Tessika McClendon, tenor Charles Miller) backed by piano, drums, bass, organ and sax. Fluellen’s “Kyrie” used five beats to a bar, layering a beautifully textured choral part over the instruments. Curenton reinvented the “Credo” as a sweet waltz. Floyd’s “The Lord’s Prayer” landed on a consoling, meditative mood. Clayton Prince (center) performs the role of the Skeptic in the "Philadelphia Community Mass." The feel-good repeated chord progression of Dilworth’s “Agnus Dei” made listeners rise from their pews to clap along, sending them on their way with a hopeful new tune. Outside Mother Bethel, two tall flags stood with the words The Mann on them, a reminder that as commissioner of new works like this, the Mann has grown beyond being just a venue in Fairmount Park, and is now as much an institution and facilitator of ideas. More significant still, not many gatherings bring together crowds for events as diverse as this one, and for one afternoon in Philadelphia, the world seemed healed. Four sections of the “Philadelphia Community Mass” and Beethoven’s Symphony No. 9 will be performed at the Mann Center June 24 at 8 p.m. Tickets are $20-$60. www.manncenter.org, 800-982-2787.